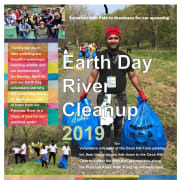 Volunteers will take a wagon ride down to the cove to collect the litter that accumulates along the Potomac. Kids are welcomed and will have access to fun, litter related activities. Share a transforming experience with a team of volunteers who care enough about our environment to roll up sleeves and beautify our precious resource. Dress for the weather and wear closed toe shoes. Each volunteer will be provided access to trash collection bags, gloves, pickers, sunblock, bug spray and bottled water.